1Lt William G. LeFevre (P) - Was CoPilot on the Capt Edward J. Broussard crew for twenty-three missions. First mission 6 Dec 1942. Completed Combat tour 25 July 1943. Upgraded from CoPilot to Pilot on 04 July 1943. 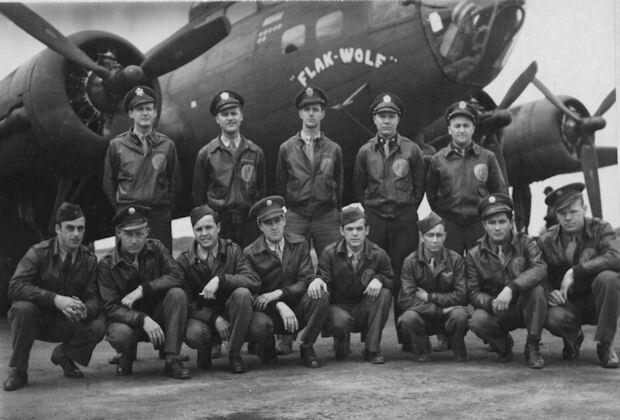 Flew two missions as 1st Pilot (49, 53) and one mission (51) as a Lead Crew Tail Gunner/Observer. Promoted to Captain after completing his combat tour. Lt Jack G. Rolfson (CP) - Missions 49 & 53. Lt Charles L. Herman (N) - Missions 49, 53. Flew on 14 missions with the Lt's Broussard (P)/Le Fevre (CP) crew (3, 5, 6, 8, 30, 32, 33, 36, 40, 41, 42, 43, 43A, 44). Lt Abbott M. Smith, Jr. (B) - Missions 49, 53. Flew on 1 mission with the Lt's Broussard (P)/Le Fevre (CP) Crew (33). T/Sgt James K. Good (E) - Missions 49, 51, & 53. Flew on 2 missions with the Lt's Broussard (P)/Le Fevre (CP) crew (11, 19). T/Sgt Dale F. Brandfas (R) - Missions 49 & 53. Flew on one mission with the Lt's Broussard (P)/Le Fevre (CP) crew (20). S/Sgt Robert K. Sink (BTG) - Missions 49, 51 & 53. S/Sgt Elwood F. Hairr (LWG) - Mission 49. S/Sgt William W. Fleming (LWG) - Missions 51 & 53. Flew on 2 missions with the Lt's Broussard (P)/Le Fevre (CP) crew (33, 36). S/Sgt Durward L. Hinds (RWG) Mission 49, 51, 53.